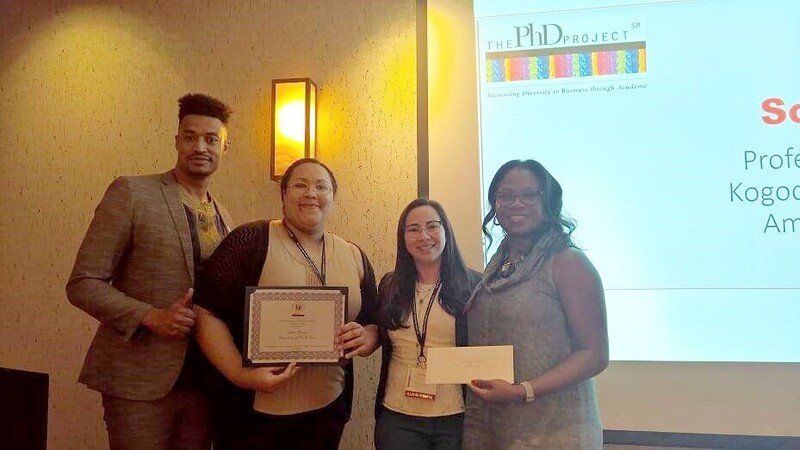 Fourth year Ph.D. candidate Lydia Njoroge was honored with the esteemed Marketing Doctoral Student Association (MDSA) Teaching Excellence Award. Founded in 1997, MDSA is a subset of the Ph.D. project, whose mission is to increase diversity in business school faculty who encourage, mentor, support and enhance students. This prestigious award is given to only one individual per year and represents a culmination of high quality nominations, teaching philosophies and student evaluations. “I love this topic and sharing it with students in a way that makes sense. Being allowed to restructure the course in a way that fits with my style helped me reflect on my teaching philosophy and course objectives,” said Njoroge. Njoroge is taking a break from teaching this year to finalize her dissertation, but anticipates continuing her teaching excellence upon graduation in May.